Hi everyone. I was a little quiet last week but it was one of the worst weeks yet. Friday a week ago my father returned to the hospital for three days (just two days after being released from his bypass surgery) for some infections and then two days after he came home, my mother went back to the hospital after having another horrible a-fib episode that caused her to pass out (and caused vomiting). We had arranged for private sitters to stay with them, so we thought the week would be smoother but and we could get back to work, but not so. I only managed to work two days last week and I got sick after my mother's last trip to the hospital. I have the worst sinus infection I've had in years. I say worst- in terms of pain and pressure, the worst. I have been bed ridden all weekend. My brother had already planned to stay with my parents, but wouldn't you know, my first weekend home in a month, and I'm in.bed.SICK. Thanks for letting me whine. And please continue to pray. My mother is having surgery tomorrow to hopefully correct the a-fib. I shared the post below as a guest post at Sumo's Sweet Stuff last month, but in case you missed it, I thought I'd share it here. This is a quick little project you can make with vinyl and a digital file cutter (or even a manual die machine and punches if you don't have a digital cutter.) I have a Silhouette SD so that's what I used for my project - monogrammed soap dispensers. I made these for Christmas gifts this past Christmas and personalized them to each recipient. These are great for any occasion. The fonts I used are Monotype Corsiva and GE Signature Script. For the polka dot holder, I cut the dots with a circle punch from some scrap vinyl. You can certainly cut them with your digital cutter, but a punch is a great way to use up those small leftover scraps. The "D" was sized to 2.5 x 2 inches in my Silhouette program. Sorry, I didn't save all the dimensions for these, but I saved a few and this may help you to know if you are in the ball park if using a similar soap dispenser. The "J" frame below was sized to 2.74 x 2.42 inches. I sized my frames and then placed the letters in text boxes over the frames to make sure the letters were the same size and in the proper places. 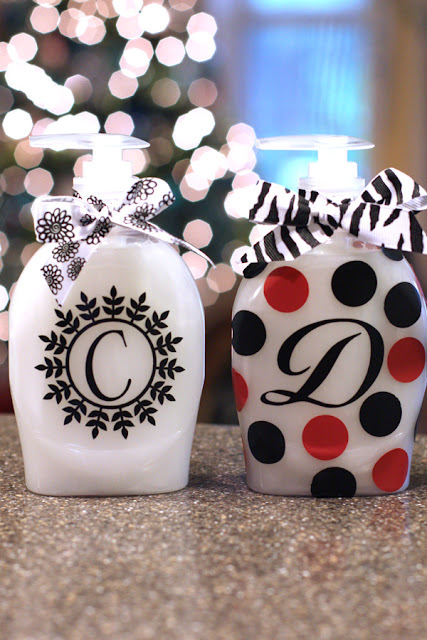 Once you cut them, the letters will be individual pieces and you will have to realign them when placing them on the bottle, but this step helps to insure the letters fit in the frame. 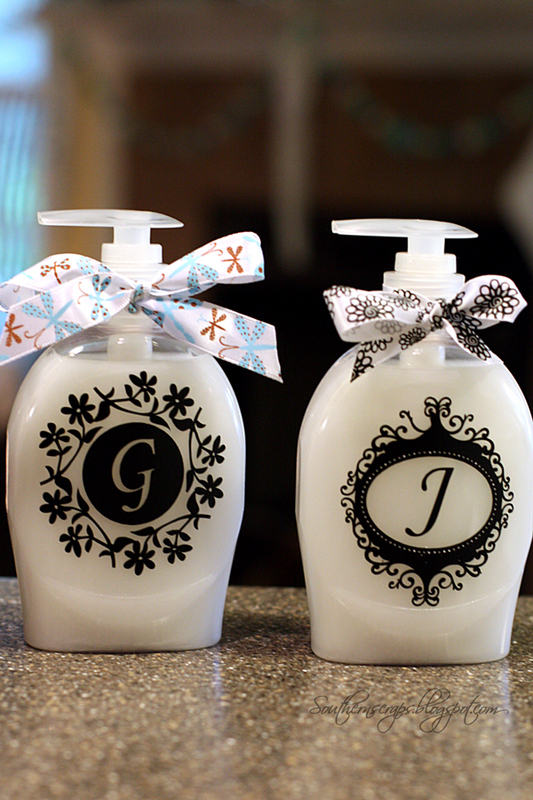 After applying my decals, I adorned each bottle with a bow. I chose ribbon that fit the personality of my recipients- flowers for my mother and mother-in-law who both like flower gardening, dragonflies for my sister-in-law who collects dragonfly ornaments and trinkets, and the zebra print for my niece who likes animal prints. I think that these little details go a long way in personalizing gifts. I'm so sorry to hear about your parents! I hope everyone is on the mend soon. 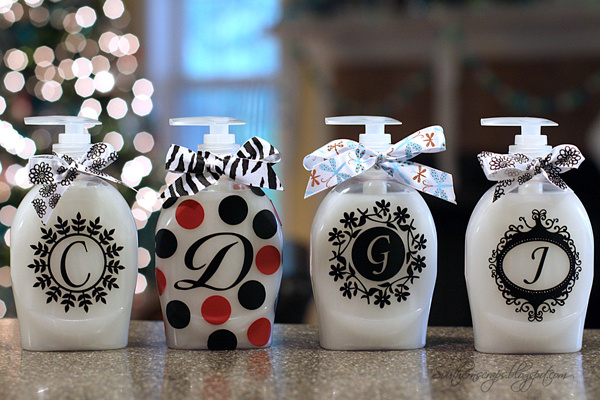 Your soap dispensers are so adorable. These are beautiful! Thanks for sharing. Enjoy your day! So cute! I want a Silhouette so bad!! These are so pretty! I'm with Jeni, I want a silhouette. I'd be thrilled if you'd link up at this week's Off the Hook! This is such an adorable project! I just wanted to let you know that I'm one of the co-hosts from the Ginger Snap Craft Wow Me Wednesday party and that I'm featuring your wreath on my blog!